From Sunday evening, it was a tense situation in Chennai with hundreds of police personnel patrolling the roads and streets. The news started to spread the critical health condition of Jayalalithaa who was by then hospitalised for more than 70 days. The city was on high alert. The shops shuttered by Monday evening with some news channels reporting the chief minister’s death. However, it was officially announced, around midnight that the Chief minister Jayalalithaa died on Monday (5.12.16) at 11.30pm. A lot of people in Tamil Nadu were in grief over the demise of their Chief Minister Jayalalithaa popularly called ‘Amma’. It’s true that the larger than life populist politician Jayalalithaa commands a huge following from her heydays in Tamil cinema industry and a conscious drive to promote her cult of personality during her influential political tenure with many piece meal welfare programs, and freebiesi that were dispensed as a part of her electoral tactics. However, the grieving of those millions of people towards a leader that they are familiar with for a long time also shows the gratitude and generosity of those very ordinary people for whom the corrupt and opportunistic politics of Jayalalithaa is of no real significance. Speculations of all kinds were littered over the entire hospital episodes and the untimely death of Jayalalithaa particularly after the consequent electoral victory in a key state like Tamil Nadu. The ratings driven media sensationalism is too keen to spot nuances over the fast paced funeral procession of the state chief minister who is also the de facto leader and general secretary of ADMK – a prominent party with more than 10 million members. It’s true, that narrow cliques of power hungry individuals concealed in the top echelons, in and outside party are ready to step in to rein this ruling party of Tamil Nadu. May be a palace coup but to avoid an objective analysis of why in a mass party the power is concentrated and often wrested between a handful people is just an incomplete appraisal of the status quo! Such is the character of politics in here where the mainstream party leaders are demagogues, completely cut off from any democratic accountability to the party workers. The party leadership itself is lodged with a privileged bureaucratic apparatus where sycophancy and unconditional loyalty prevail over credibility. M.G.Ramachandran (MGR), Jayalalithaa and Karunanidhi – the leaders at the helm of Tamil Nadu politics for more than last four decades have always put their interests and their quest to power before the party or the people, and virtually made sure that they are unchallenged within the party. Any possible contenders will be completely sidelined or expelled from the party. Hence the crisis of a leadership after Jayalalithaa may open up a new period of political turmoil in the state. The insurgent Dravidian movement with the leadership of Periyar, despite its reformist roots saw the huge mobilisation of the oppressed and the downtrodden masses. This created a strong social base of progressive politics, from which the opportunistic off shoots of DMK lead by C.N. Annadurai set off the era of populist electoral politics which largely defined the mainstream politics of Tamilnadu. Karunanidhi a powerful script writer, orator and a key organizer took control of DMK after the death of then chief minister C.N. Annadurai. The matinee idol M.G. Ramachandran popularly M.G.R., promoted DMK through his movies. Later when M.G.R. was expelled from DMK, he founded Anna Dravida Munnetra Kazhagam (ADMK). However, he was not entirely able to severe his links with the Dravidian Movement. The social base that the ADMK inherited was a mixed bag. The elements of populism, progressive and egalitarian politics that M.G.R. popularised with his movies and rhetoric had its impact on ADMK’s policies. Nevertheless the utterly corrupt regime of M.G.R. openly betrayed the promised expectations. Jayalalithaa, a talented and well educated actress, despite overcoming many hurdles in her way to the ADMK leadership, did not waver a great deal from the path that was worked and laid out by her mentor M.G.R. The largely patriarchal political parties’ in-fact crudely reflected the society. If it wasn’t for her personal ability and conviction, Jayalaithaa might not have made it. Ironically nothing much has changed for the lot of women despite Jayalalithaa’s 15 years of rule. The legislative assembly in Tamil Nadu is still largely infested by men. At the same time it is a real travesty to compare the social and economic indicators of Tamil Nadu with the rest of Indian states which are all mostly impoverished and backward with political parties and leaders who got no serious intentions to change the society for better to provide a decent life for the people. Ordering the arrests of tens of thousands of state government employees and teachers under the trade union busting acts like Essential Services Maintenance Act (ESMA) and Tamilnadu Essential Services Maintenance Act (TESMA) dismissing more than 1.5 lakh workers, unleashing brutal acts like the Prevention of Terrorism Act (POTA) over the activists, crushing the Kudankulam protests, and strengthening the state against the protesters by extensive policing, spying etc. Jayalaithaa administration was primarily authoritarian, pro-capitalist and pro-landlordists that also took a calculated understanding of mass movements and people’s sentiments. As there were significant policies backtracking like her ‘U-turn” with the anti conversion act after the parliamentary electoral setbacks and also softening her stand over the Eelam issues – are mainly due to the extensive mass support, show those classical opportunistic maneuvers of Jayalaithaa when being severely pushed by people’s movement and resistance. The true legacy of the Tamil Nadu Chief Minister Jayalalithaa, is the legacy of the late Chief minister MGR and the Ex Chief minister M. Karunanidhi -the legacy of political bankruptcy, legacy of the despotic power politics, the typical legacy of a shameless, opportunistic political class in a deprived region exploiting and oppressing the masses. The true legacy of Jayalalithaa, is of someone who was no longer able to control the corrupt system that she herself fostered all through her regime. 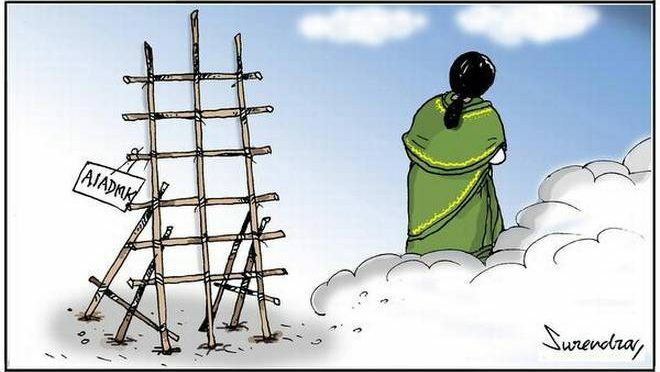 At the same time the political vacuum that has existed so far is further entrenched with the demise of Jayalalithaa. It’s nevertheless true that Jayalalithaa as well the DMK were looked upon by many serious activists, as a bulwark not only against reactionary BJP, but the national parties in general who historically overrode the regional interests and particularly the interests of Tamil people with the way they dealt with Hindi language imposition, Eelam issue, the Cauvery water issue, etc. Also the presence of BJP Union minister Venkaiah Naidu throughout the funeral and the rumours of Modi’s intervention in the backstage exercise of power transfer to Sasikala and her already super rich family, are all making it apparent that the saffron gangs are all set to squander this crisis. The political crisis arising out of the death of Jayalalitha poses very important questions to the left in particular. The very lack of an alternative ‘the subjective factor’ to turn the events to the advantage to lead struggles against the system is time and again showing up in the entire country. Whether it is the growing atrocities on poor in the name of Hindutva or the fiscal madness unleashed by the Modi administration, all the evident anger is dissipated for want of a leadership. The Communist Party leaderships have utterly failed to lead the masses who are much ahead of the leadership in combativity. The crying need of the hour is to establish a genuine Socialist Alternative that can harness the energies to over throw this corrupt system. In the same time it is also crucial, for the genuine political activists to seriously question and campaign against the existing levels of political culture prevailing here. Authoritarianism, sycophancy, corruption, political thuggery, denial of party and organisational democracy, demigod leaders, and personality politics should all be thrown out of the political sphere. Let’s work for a new political culture fostering serious debates, engaging the issues of the ordinary people, and to encourage young layers to come, and join us to fight against the tyranny of oppression and exploitation. i AMMA’S VICTORY, THE POLITICS OF FREEBIES AND THE LOOMING TURMOIL! Amma’s Victory, the Politics of Freebies and the Looming Turmoil! Previous PostGeneral Strike 28th November – Modi has failed the people, Must go!Next PostSecurity of security guards at stake at S.P. Pune University!